Whether you are a recreational, sporting, or commuter cyclist, now that the fall equinox is but a dim memory you will find less daylight to ride. The good news is that the market for light systems continually improves. Light & Motion debuts a new Taz series of multipurpose headlights. The Taz800 and Taz1200 take the multiple LED format of the the performance series Seca (review of the Seca 800) and combines it with the best features of the commuter-targeted Urban series light, specifically amber sidelights, USB charging, and all-in-one body. I’ve been testing the Taz1200, which like all Light & Motion, gets its name from the actual number of lumens it produces maximally; this is a f****** bright light. What’s more, the 3 LEDs are complimented by the specially shaped back mirrors and diffused lower half lens, giving a broad and fairly even beam which is a lot easier to see by than a searing single point of light. The Taz has 3 different output levels (high, 50%,25%, plus a flash & pulse mode) that are accessed sequentially by one of the two buttons atop the unit; hold down the button to shut off. The second button independently controls the amber sidelight (constant, pulsing, off). These are an absolutely brilliant safety option when you ride city streets, warding off the dreaded side street t-bone, but for offroad riding you can turn the sidelights off if you find them distracting. The The USB charge port is located on the unit’s underside just ahead of the stout looking rubber mounting strap. The Taz series, like the Urban series, uses a micro-USB receptacle, and a short power cord is included in the retail package. 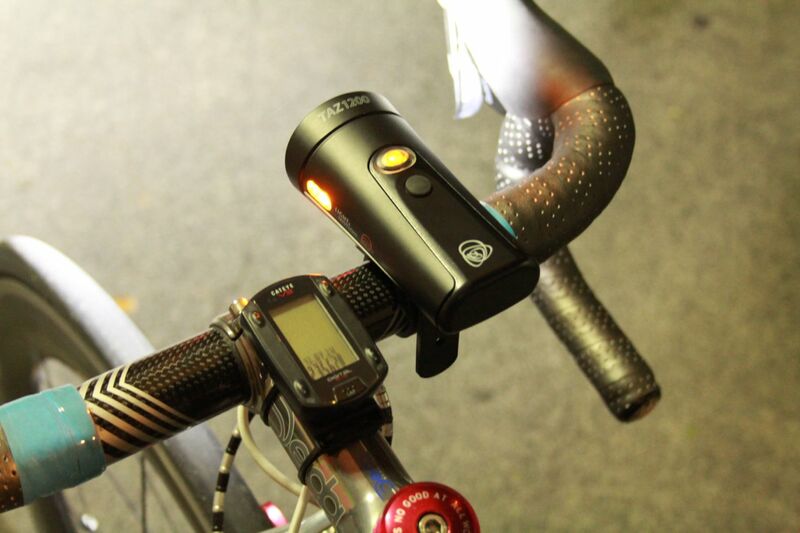 The main button on top is translucent so an LED can give charge status, for both on the bike usage and during recharging. 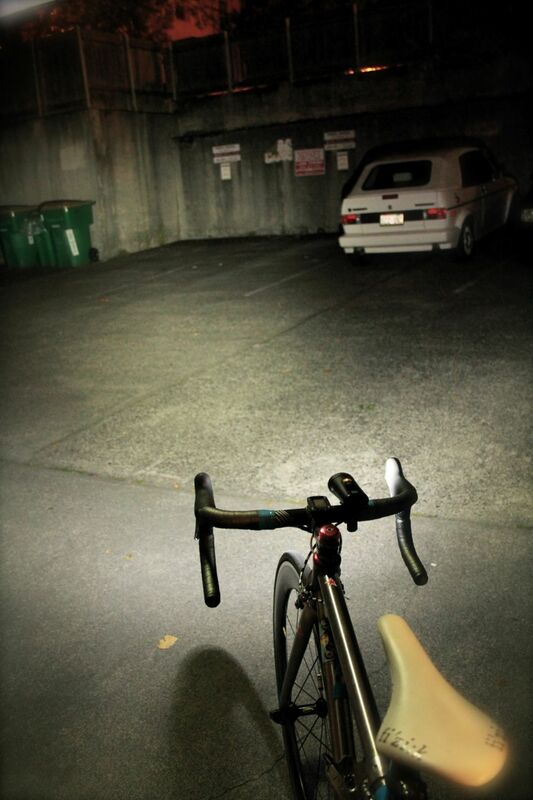 At full burn 1200 lumens, the light gives about 90min; 6hrs at 25%. At $299, this isn’t cheap per se, but the Taz1200 is a system several orders of magnitude above even the best AA cell-powered headlight. Even saying all that, there are a few inconvenient aspects to the Taz light. First, as essentially a super version of Light & Motion’s dainty Urban headlight, the Taz is larger in every dimension and thus takes up more space on the handlebar; the Taz exceeds the literal definition of “pocket-sized” (unless you have really big pockets). One thing I really like about the Urban headlight is that I can hang it upside down, beneath my handlebar, but you can’t do that with the Taz because the shaped lens would produce a poor beam pattern if flipped. For some handlebar diameters and textures (apparently my 31.8mm gloss carbon bar), the extra mass of the Taz can cause the light to slip nose-down during high-frequency chatter like cobbles or construction-ravaged pavement unless you use the included rubber foam grip tape on the intended mounting area. This despite the obviously beefier mounting strap. Comparing the Taz to the Seca series, the more performance-oriented Seca1700 has a similar burn time but the you could bring a second battery pack for epic night riding or just go all out and get the Seca1700 Enduro version with double the battery capacity. The Seca head units by themselves are featherweight and virtually never move inadvertently, and the mode/power button requires less pressure to toggle through modes. However the Taz1200 is less expensive than even the lower output Seca800 and can be charged via USB. And if you lock your bike up outside, you might want to consider that the Seca head unit and separate battery can be tedious to remove whereas the Taz can be qucikly removed and popped into your bag (or as the case may be, ridiculously big pockets). To sum it up, if you are looking for that one headlight that could be near the best possible in multiple situations, the Taz is it. I see this as the light for the serious commuter or a guy with just one bike. 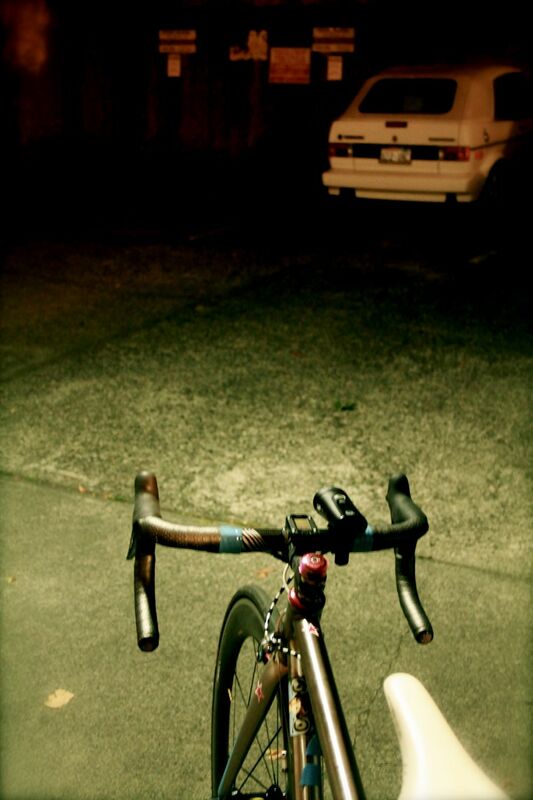 Conversely, if you have a bike stable perhaps going with an Urban series headlight and a Seca for different riding usage might actually make more sense.